You Don't Need A Plan "B"
Personally I have a hard time with plans. How many times have you made a plan, thought it out very carefully, made a “to do” list or punch list, only to have the thought crop up: “What if it doesn't work? The immediate answer is usually: “We go to plan ‘B”. 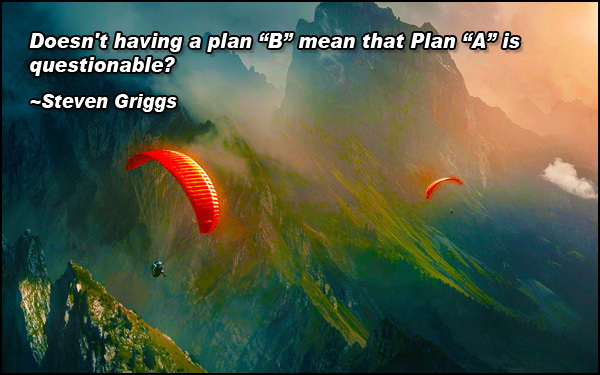 Doesn't having a plan “B” mean that Plan “A” is questionable? Aren't you already admitting that there is a huge problem with plan “A”? At the very least it shows that you don’t really believe in the plan. And if you don’t really believe in it, isn't that really the same thing as not having a plan? I’m not saying every plan is bad. But by having a plan you are trying to control the outcome. You might say but that’s the point! You want to control the outcome! You need a battle plan to execute your strategy! Everyone knows that you need a battle plan! Except for one thing: Battle plans change immediately. But how do you accomplish anything without a plan? You need a business plan, a business strategy in order to understand the steps, in order to know what to do at the right time, right? Step one leads to step two and so forth, right? But that’s not what really happens. Step 1 takes longer to accomplish so you jump to Step 2, but step 2 is really not complete without step 1 so you jump to 3, but then step 3…… . The dominoes never fall in lockstep. Plus, I believe business plans are too slow. They are actually dangerous. Anytime you have a business plan you create a framework based on steps. Like I said above, the steps may not all be quickly or easily accomplished, there will be hiccups. It also becomes a bit mechanical, checking off your progress, building the business step by step. You lose focus. Business today moves too fast to have a written, methodical plan. Things just change too quickly. I also think there can be a tendency to lose your focus. The steps show progress and become important, too important. You become wedded to and in some ways locked in to the steps of the business plan and take your focus off the real goal. Oh, by the way, what is the goal? Are the steps or the framework the goal? That is the crucial thing. Are you really clear about your ultimate goal? Do you have a clear intention about what you are working to accomplish? What you are going to achieve? That is the key, having a clear intention, an emotionally charged connection with your goal. Once you do, you won’t have time for a business plan you will be too busy making it happen. You won’t need a list because everything will start happening too fast to write it down. You will be light on your feet, sensing the changes, adapting and modifying on the run. So set your intention. Connect with it on an emotional level. See the end. The Who, What, Where and How will show up on time. You will know what needs to be done when the time comes. Once you really connect with the object of your intention, you won’t ever need a Plan “B” or even a Plan “A”.